When it comes to accommodations, we are very well aware that everyone has a different preference. It is to cater to that different taste that our hotel has different kinds of rooms. We have both ac and non ac rooms at the property. Each and every room at our property has been paid great individual attention to ensure it offers comfort without compromising on splendor. 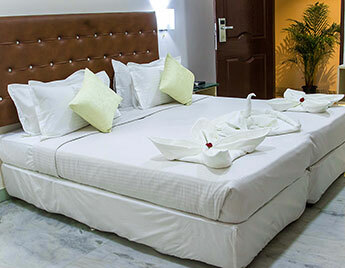 All the rooms are designed elegantly and are affixed with the basic amenities and facilities. They also each come with a private attached bathroom. Our deluxe twin rooms redefine comfort and simplicity. 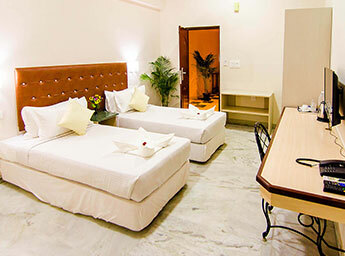 The rooms are elegantly designed and well furnished with the basic amenities. Every room comes with an attached bathroom and is perfect for solo or couple travellers. Extra bed is provided for an additional fee. We know that most of the families like staying close when they are vacationing and our family rooms are designed for the same purpose. Our family rooms are spacious enough to accommodate the guests and extra beds are provided at a fee if need be.